Last Week's theme was "Black & White". 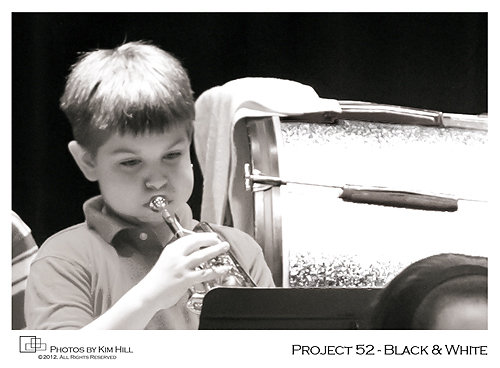 The school had their annual spring band concert which our oldest son participated in. This was his first year playing trumpet. This particular image is a tiny portion of a much larger image including more of the band members. But for privacy reasons, I decided to crop it down to show my son just in case the other parents wouldn't want their kids' photo posted online. :) For those interested in camera settings, I shot this with my Canon 70-200L handheld at 200mm, ISO 3200, 1/100th at F3.2. This entry was posted in Photography - General, Project 52 and tagged band, Cicero NY photographer, concert, Kim Hill, music, photo theme, photography, Photos by Kim Hill, Project 52, stage, Syracuse portrait photographer, trumpet. Bookmark the permalink. Gotta love how the b&w solves the funny lighting/color issues! I love how intent he looks!